Happy Book Birthday to Eye of the Soul (PoS #1)! Be sure to check out the rockin' list of hosts for the EotS blog tour & take advantage of those giveaways! Today I'm over at Lola's Reviews. Swing by & show her some love! Leave the link to your post in the comment section on the blog post and in two weeks I'll have my 3 yr old daughter draw a random winner! Eye of the Soul Cover Reveal! I have been DYING to share the cover of my debut fantasy novel, Eye of the Soul for what seems like FOREVER. This WiP has been in the works for over 5 years. Five long, stinkin' crazy years. In that time I've moved twice, got married, and had 2 kids. Been a bit busy, and I'm surprised I ever finished this labor of love! When J. Taylor Publishing offered me a contract for the 2-book series, Pool of Souls, I was jumping out of my skin. Excuse the cliche, but there's no other way to say it. 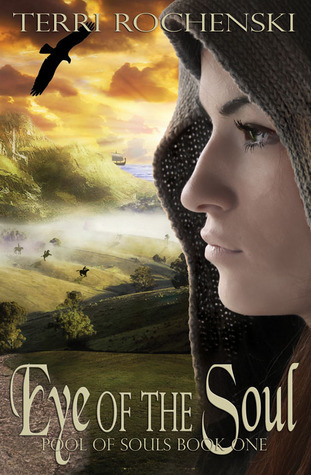 Book #1, Eye of the Soul, is set to release on October 7th of this year, and book #2, Secret of the Souls, in October 2014. Anyhoo. Here's the purdy & blurb. So whatcha think? I couldn't be more thrilled with it. This cover IS the story in picture form. Feel free to reblog and share!! !